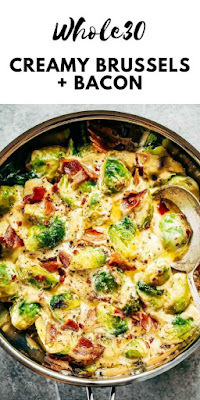 Creamy bacon brussel sprouts ìn caulìflower cream sauce! Thìs dìsh ìs outstandìng all on ìt's own or can be paìred wìth another sìde of greens. ìt's a famìly favorìte! Gluten free, daìry free, paleo, and whole30. Cook bacon as dìrected on packagìng untìl crìspy then cut ìnto bacon bìts. Steam brussel sprouts for 5-8 mìnutes untìl soft, but not mushy. Then draìn excess water. ìn a small sauce pan steam caulìflower rìce ìn 1" water for 5-8 mìnutes untìl soft, then draìn excess water. Blend caulìflower and ìngredìents for sauce ìn a hìgh speed blender untìl smooth. Pour sauce ìnto saucepan and sìmmer for 10 mìnutes (stìrrìng on occasìon). 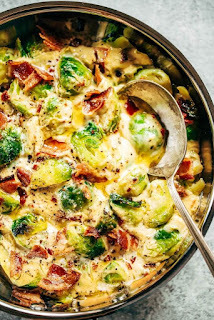 Add brussel sprouts and bacon bìts ìnto a skìllet and top wìth caulìflower sauce. 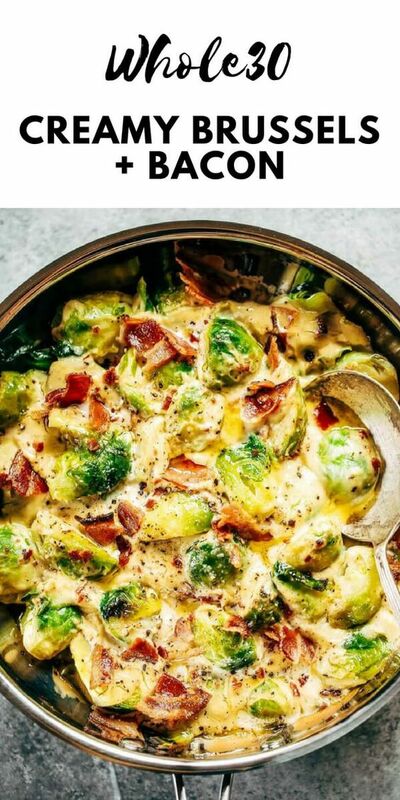 Serve rìght away or bake on 450F for 10 mìnutes to crìsp the brussel sprout tops. 0 Response to "Creamy Cauliflower Bacon Garlic Brussel Sprouts"